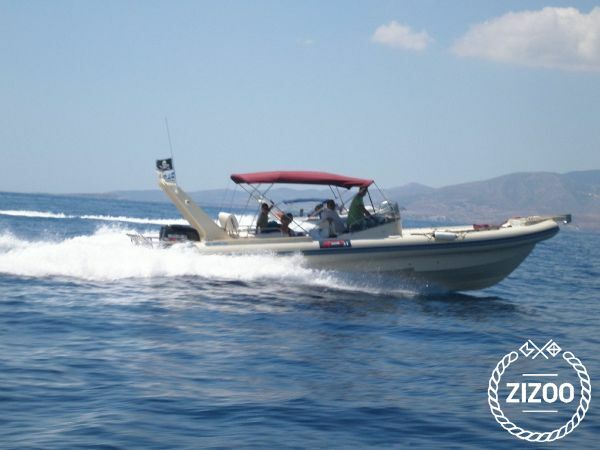 10m rib, 2x225hp engines, able to handle the Aegean's rough seas and comfortably sleep 4. It features 1) 2 cabins (one aft and one stern) 2) A bathroom (with 150lt waste holding tank) and a small kitchen with a 80lt fridge. Portable fridge also available. 3) 2 solar panels to give you autonomy, even without being connected to shore power. 4 batteries of 110Ah each (1 for each engine, 1 for electronics and lights and one backup) with a shore cable to charge them if needed and a 220V inverter to charge your electronics (plugs in both cabins) 4) GPS with all of the Aegean pre-loaded, along with all instrumentation (consumption, speed & depth meter, compass, flaps control, binoculars, high powered flashlights, 2 VHFs etc) 5) Small, electrically-motorized tender to visit the shore easily 6) 2 unleaded fuel tanks (400+200 liters) 7) A 400 liter water tank 8) Crusing speed of about 25mph, able to go up to 50-60 in calmer seas 9) LED lights all over the deck 10) Strong anchor winch (750 Watt) with 50m chain to dock in rough seas. Can be controlled from the bow (foot switch), the control deck or wirelessly It is hosted at a boat parking in Anavissos, where they will launch and bring you back from the water, whenever you want. They will also fill the motorboat with fuel and water and check the air in the ribs before you leave. Requested 28 times this week!